We welcome you to a full e-text version of Emily Bronte's dark masterwork, Wuthering Heights. In the past we have found the very often we link to a website and by the very nature of the beast that is the internet, the said website vanishes, so, in answer to this we decided it was best to have our own version of this book right here as a mini-website of the main website, Consider The Evidence. 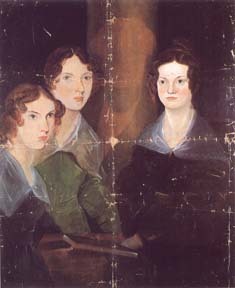 The text we are using is based upon the second edition if Wuthering Heights that was published in 1850 with an accompanying biographical notice by Charlotte Bronte, this in turn was published by Penguin Classics, to whom we are deeply grateful. The text is copyrighted to them, and the layout of the site itself is copyrighted(see to your lower right). a note on this picture: if you look very closely at the centre, you just maybe able to discern a vague outline of another person. This was a self portrait of Bramwell Bronte, but for some reason he disliked it and attempted to cover it up. 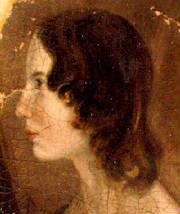 Recently this portrait has been the subject of restoration and Bramwell Bronte is back in the picture.